Researchers from Lancaster University and Small World Consulting conducted a quantitative analysis of global and regional food supply to illustrate the trends in calories, protein, and the micro-nutrients vitamin A, iron, and zinc, from production through to human consumption and other end points. The results are published in Elementa Science. According to the results of their study, the current production of crops is sufficient to provide enough food for the projected global population of 9.7 billion in 2050, although very significant changes to the socio-economic conditions of many (ensuring access to the global food supply) and radical changes to the dietary choices of most (replacing most meat and dairy with plant-based alternatives, and greater acceptance of human-edible crops currently fed to animals, especially maize, as directly-consumed human food) would be necessary. Under all scenarios, the scope for biofuel production is limited. The researchers stressed that if the world population continues on a ‘business-as-usual' dietary trajectory, a 119% increase in edible crops grown will be necessary by 2050. Read the research article in Elementa Science. Global biotech seeds market is projected by industry experts to grow at a compound annual growth rate of 9.87% during the period 2018-2022, according to Absolute Report's Global Biotech Seeds Market 2018-2022 report. The report covers the present scenario and the growth prospects of the global biotech seeds market. To calculate the market size, the report considered the revenue generated from the sales of the most planted biotech crops including soybeans, corn, cotton, and canola. The report also provides a comparison of key countries based on contribution to global as well as regional level with manufacturers, types, applications, opportunities, challenges. Read more from Absolute Reports. The U.S. Department of Agriculture's (USDA) Animal and Plant Health Inspection Service (APHIS) has announced the deregulation of a cotton variety from Bayer CropScience genetically engineered (GE) for resistance to the herbicides glyphosate and p-hydroxyphenylpyruvate dioxygenase (HPPD)-Inhibitors such as isoxaflutole. APHIS prepared a draft plant pest risk assessment (PPRA), draft environmental assessment (EA), preliminary finding of no significant impact (FONSI), and a preliminary determination of nonregulated status. These documents were available for a 30-day public review and comment period on June 7, 2018. After considering the public comments, APHIS has determined it is unlikely to pose a plant pest risk and is deregulating this variety of GE cotton. Pursuant to the National Environmental Policy Act (NEPA), APHIS conducted a thorough review of the potential environmental impacts and prepared a final EA, and concluded in its final PPRA that this variety of GE cotton is unlikely to pose a plant pest risk to agricultural crops or other plants in the United States. For more details, read the news article from USDA APHIS. A study from Purdue University led by Daniel Szymanski has mapped a complex series of pathways that control the shape of plant cells. The research team used the model plant Arabidopsis to map the complex pathways that control plant cell shape. The findings may be key to improving the quality of cotton grown in the United States. Szymanski, professor in the Department of Botany and Plant Pathology, analyzed how intracellular signaling networks pattern cell walls to generate particular cell shapes and sizes. In a paper published in Current Biology, Szymanski described how microtubules and actin, protein polymers that form the cytoskeletons of plant cells, are organized to specify the mechanical properties of cell walls that define cell shape. The research group found that microtubules entrap a protein called SPIKE 1 within the apex of another cell where SPIKE 1 recruits additional protein machineries that cause actin filaments to form. Actin filament networks are then organized as roadways for long-distance intracellular transport and the regulated delivery of cell wall materials that are necessary for cell growth. According to Szymanski, SPIKE 1 is a master regulator in cells, a switch that when activated determines the time and location where actin networks are polymerized. He added that the location and activity of SPIKE1 is important. Without it, growth is misregulated, leading to distorted cell shapes that do not taper properly. The Food and Drug Administration (FDA) of Iran has obliged food producers and importers to label all food products, whether they contain ingredients derived from genetically modified organisms (GMOs). This was announced by Gholam Reza Asghari, head of Iran's FDA. Asghari stated that GMO labels must be put to GM products such as soybean oil and corn oil starting July 23, which is the beginning of the current Iranian calendar month of Mordad. By next month, all products with ingredients derived from GMOs will also be affixed with proper labels. He also emphasized that many countries label their food, whether GM or non-GM, and that GM ingredients are usually cheaper, and can be used according to the consumer's preference and income. Read more from Tehran Times. The Philippines is losing as much as PHP33.85 billion (US$634 million) because of the delay in commercializing the insect resistant Bt eggplant, according to Dr. Cesar Quicoy, an economist from the University of the Philippines Los Baños. 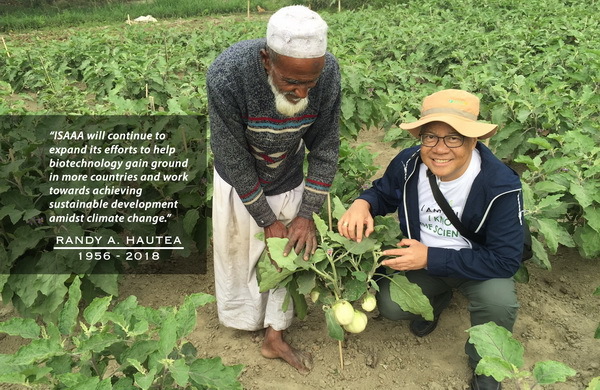 Dr. Quicoy studied the cost of delaying the commercialization of Bt eggplant in the country in three different adoption rate scenarios: 15%, 30%, and 50% of the total eggplant production. At a 50-percent adoption rate, eggplant producers could have earned at least P33.852 in potential revenue in the first year of Bt eggplant commercialization. 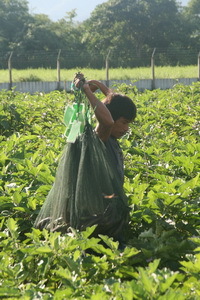 By the 10th year of adoption, Filipino farmers could have gained a total of P374.889 billion. The crop, developed by the Institute of Plant Breeding UPLB, could double the net income of farmers. Dr. Quicoy presented the results of his study during The Economics of Biotech Crops: A Symposium to Promote Economic and Financial Literacy symposium held on July 17, 2018 at the SEARCA Umali Auditorium, Los Baños, Laguna, Philippines. Read more from Business Mirror. The scheduled public consultations for the field trial of GR2E Golden Rice in the Philippines have been completed. The local government units of Muñoz, Nueva Ecija and San Mateo, Isabela have engaged the public in the consultation on July 18 and 19 to allow community members to ask questions about the proposed field trial and submit their comments to DA-BPI. Project leader Dr. Reynante Ordonio said, "This empowers the communities to participate responsibly in a critical biosafety decision-making process. The communities will be provided with all the information about the project and Golden Rice, which were also posted in the community's most accessible areas." 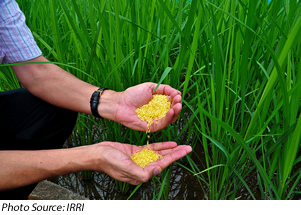 The Philippine Rice Research Institute (PhilRice) is the government agency that leads the development of Golden Rice in the Philippines. PhilRice applied for a biosafety permit to conduct field trials on February 28, 2017 following the requirements of the Joint Department Circular No. 1 series of 2016. For more details, read the news release from PhilRice. Most of the Bt cotton varieties express Bt genes in all whole-plant tissues. Scientists from Ankara University in Turkey and partners developed a triple-gene construct for the confined expression of GNA, cry1Ac, and cp4 epsps genes to targeted insect biting sites instead of whole-plant tissues. They cloned it at downstream of a wound-inducible promoter isolated from Asparagus officinalis (AoPR1). Furthermore, to widen the range of resistance, GNA was driven by the 35S promoter to target the sap-sucking insects such as aphids which impose large losses in cotton production. To select the transformants in selection medium and for glyphosate tolerance, cp4 epsps gene was included with GNA and cry1Ac genes. Results showed that the introduction of cry1Ac and GNA to cotton plant conferred resistance to Spodoptera littoralis (African cotton leafworm) and Aphis gossypii Glover (cotton aphid). The results indicate that the restriction of cry1Ac protein to insect biting sites along with a plant lectin attributes significantly contribute to insect pest management strategies. Read the research article in Plant Biotechnology Reports. Tomato (Solanum lycopersicum) is threatened by a number of major diseases worldwide, and developing management practices against them has been difficult. University of Florida researchers, led by Juliana Pereira, aimed to improve tomato disease resistance by overexpressing genes encoding the Arabidopsis thaliana Elongator subunits, AtELP3 and AtELP4. Overexpression of AtELP3 and AtELP4 significantly enhanced resistance to tomato bacterial speck caused by Pseudomonas syringae pv. tomato without clear detrimental effects on plant growth and development. Interestingly, the transgenic plants only exhibited resistance to Pst when inoculated through foliar sprays but not through infiltration into the leaf apoplast. Further analysis revealed that a group of defense-related genes were highly induced after infection in the AtELP4 transgenic tomato plants compared to control plants. This suggests that the enhanced resistance of the transgenic plants may be attributed to elevated induction of defense responses. Furthermore, the tomato genome contains single-copy genes encoding all six Elongator subunits (SlELPs), which share high similarities with the AtELP genes. The SlELP3 and SlELP4 also complemented the Arabidopsis Atelp3 and Atelp4 knock-out mutants, respectively, suggesting that the AtELP and SlELP genes have similar functions. These results reveal potential candidate genes for engineering disease resistance in tomato. 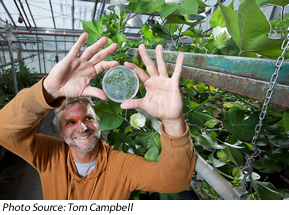 Recent progress in genome editing methods has opened new avenues for reverse genetics studies in plants. One of these is the CRISPR-Cas9 system, which has been used to induce targeted mutations in a variety of organisms. A Hankyong National University research team described a targeted mutagenesis using Agrobacterium-delivered CRISPR-Cas9 in tomato. This new system uses an Agrobacterium vector and three guide RNAs for single gene targeting. The team, which was led by Yu Jin Jung, evaluated the system for its mutagenesis frequency and heritability by testing it on the LeMADS-RIN gene of tomato. Individual events carrying mutations in the LeMADS-RIN gene occurred in 10.6% of the transformed tomato genotypes. Compared with wildtype plants, the edited mutants exhibited more incompletely-ripening fruits and lower ethylene contents. Analysis also revealed that the desired mutant alleles are inheritable and could be retrieved in the succeeding generations. For more information, read the article in Korean Journal of Horticultural Science & Technology. The female gametophyte is important to facilitate sexual reproduction in higher plants. However, not much is known about the molecular mechanisms of its development. The team of Lin-Xiao Li from China Agricultural University recently studied the Arabidopsis thaliana NOP10 gene (AtNOP10), and its role in female gametophyte formation. Analysis revealed that the AtNOP10 protein was expressed in seedling and reproductive tissues. It also shares a high level of amino acid sequence similarity with Saccharomyces cerevisiae NOP10 (ScNOP10). To study its role, the team developed CRISPR-edited mutants with knocked out AtNOP10 gene. The knock-out resulted in the interruption of mitosis of the functional megaspore during early development. It also prevented the polar nuclear fusion in the embryo sacs. The AtNOP10 gene was found to influence megaspore mitosis and polar nuclear fusion during gametophyte formation in Arabidopsis. In grasses, the spikelet is a unique inflorescence structure that directly determines grain yield. Despite a great number of studies, the mechanisms behind spikelet development are not fully understood. Deyong Ren from China National Rice Research Institute studied the FZP gene and how it influences grain size and sterile lemma identity in rice (Oryza sativa). Mutation of FZP causes smaller grains and degenerated sterile lemmas. Analysis revealed that the small grains from the fzp-12 mutant were caused by a reduction in cell number and size in the hulls. Interestingly, the sterile lemma transformed into a rudimentary glume in the mutants. Meanwhile, the sterile lemma transformed into a lemma in FZP- overexpressing plants. To confirm their hypotheses, the team used CRISPR-Cas9 gene editing to modify the FZP gene, generating rice lines with similar phenotype to the fzp mutants. Further analysis also revealed that FZP may also be involved in regulation of the downstream genes. These results confirmed that FZP plays a role in the regulation of grain size. This study also provides evidence that the lemma, rudimentary glume, and sterile lemma are homologous organs. For more information, read the article in Journal of Experimental Botany. 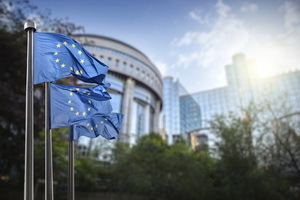 More than 60 organizations, including public and private research centers, universities, academies, technical institutes, and professional agricultural organizations and scientific leaders from different European countries have called for a "European Initiative for plant genome editing". Read the entire letter in English, French, or German. Alpha-linolenic acid (ALA) deficiency is considered as a major cause for the high incidence of cardiovascular, inflammatory, and autoimmune diseases in humans. In recent years, tree peony (Paeonia suffruticosa) has been found as a good source of ALA due to the high concentration of ALA in its seed oil. However, the mechanism of the ALA accumulation in tree peony seeds remains unknown. Chinese Academy of Sciences' Dan-DanYin, together with colleagues performed comparative analysis between two tree peony cultivars, ‘Saiguifei' and ‘Jingshenhuanfa', with different ALA contents. Analysis revealed the importance of microsomal ω-3 fatty acid desaturase 3 (FAD3). The team then studied the PsFAD3 gene from tree peony seeds and found that the gene's expression levels were consistent with ALA accumulation in seeds. Expression of the gene in Saccharomyces cerevisiae and Arabidopsis thaliana confirmed that the isolated PsFAD3 gene catalyzes ALA synthesis. These results indicate that PsFAD3 is involved in the synthesis of ALA in seeds and could be used in the development of new tree peony cultivars with high ALA content as well as other crops. For more information, read the article in Plant Science. Ralstonia eutropha is an important bacterium for the study of polyhydroxyalkanoate (PHA) synthesis and CO2 fixation, making it a potential strain for industrial PHA production and CO2 conversion. However, current methods for genome editing the microbe are inefficient. Thus, developing an efficient method for R. eutropha genome editing is imperative. The team of Bin Xiong from the University of Chinese Academy of Sciences developed a method for R. eutropha using an electroporation-based CRISPR-Cas9 technique. Using the new method, five R. eutropha genes were successfully edited via homologous recombination, with efficiencies ranging from 78.3 to 100%. The team also found that fructose can reduce the expression of the arabinose-inducible pBAD promoter, which was used to optimize the expression of cas9. The CRISPR-Cpf1 system and the non-homologous end joining mechanism were also investigated, but failed to yield edited strains. This study presents the first genome editing method for R. eutropha using an electroporation-based CRISPR-Cas9 approach. This will facilitate more studies and applications of R. eutropha for PHA production and CO2 conversion. For more information, read the article in Biotechnology for Biofuels. For more details on agenda, speakers, and registration, visit the Congress website. ISAAA Global Coordinator and SEAsiaCenter Dr. Randy Hautea devoted over two decades of his life to fulfill ISAAA's mission to contribute towards the alleviation of poverty and hunger through sharing and disseminating scientific knowledge to the global community, and by facilitating the transfer of technologies to developing countries. His sudden demise left a void in the global biotech community. To help continue these vital initiatives, the Randy A. Hautea Memorial Fund will be launched. It will gather support for various biotechnology initiatives such as research, knowledge sharing, and technology transfer projects. If you are interested to get updates regarding the launch of the Memorial Fund, send an e-mail to donate@isaaa.org. Susan Wessler, co-chair of the committee that wrote the report said, "At this pivotal time in history with an expanding global population requiring more from an increasingly fragile natural resource base, science breakthroughs are needed now more than ever for food and agriculture. The United States is the world's greatest agricultural producer and bears the tremendous responsibility of implementing scientific advances to support our nation's well-being and security, and perhaps even global stability, and the tools and resources identified in this report can ensure its success." For more about the report, read the news article, watch the video, or download the infographic. Food matters. It is a basic human need, yet its availability in adequate, safe, nutritious and regular amounts for humans is by no means assured. While land and water for food production are both declining at alarming rates due to natural and human causes, the demand for food is still growing as populations all over the world increase. The unending questions - where food comes from; how it is grown; how climate change impacts the supply of vegetables and fish and what we can do about it; nutrition in diet; future new types of food that will be produced in factories; how safe is organic food and GMOs, etc. - present some of the most pressing food-related issues everyone, from leaders and policymakers to corporate chiefs and man-in-the-street, needs to be aware of. 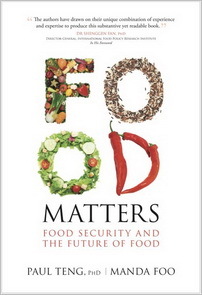 The seminal book, Food Matters, by Professor Paul Teng and Manda Foo provides explanations to the many questions asked about today's food sources and quality. Written in prose that is easily understandable, it takes the reader through the fascinating story of the origin of our common foods, how they have changed in looks and their methods of production, and discusses many issues on the minds of consumers and governments. Read more from the publisher, Write Editions. Purchase a copy online from Select Books.